VCS UI … finally…and what do you know? It’s Monday! Ok so here is the first draft of the VCS UI. There’s another part coming. With file systems, it’s often natural to view it as a kind of tree structure. So I kept that here. On the side, users will be able to navigate through their files as they would in MS Explore or other OS file system browsers. 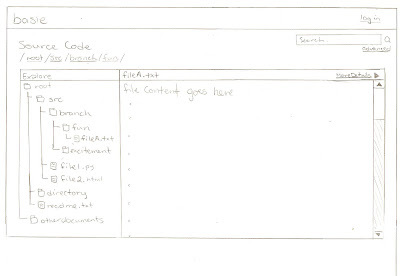 Also, when the user clicks on a file, the contents will be displayed in the right panel. You’ll also notice that there is a “More Details” link. Clicking on this will slide* out two more columns. One will be the revision number, who committed it, and the size. From there, the user should be able to select two revisions and click on a “Show differences” button and the differences will be displayed. It is still unclear what the best way to do that is. From the previous comments, a side by side view would be nice, but when i looked that that, I didn’t like the way they displayed the line numbers. I thought that it was very confusing especially if you’re doing a review. Since both documents have different line numbers, users would have to specify which line numbers they were referring to and which revision as well. I’m not a fan of this. I suggested a multi-coloured approach. Perhaps a mix of both will do and better line numbering. This entry was posted on Monday, February 16th, 2009 at 10:45 pm and is filed under Uncategorized. You can follow any responses to this entry through the RSS 2.0 feed. You can leave a response, or trackback from your own site. 4 Responses to VCS UI … finally…and what do you know? It’s Monday! – If the ‘More Details’ opens up rev #, author, and size then the columns should be next to the file so that info can be seen there (row for each file). – Information about the file would be good to have in a separate pane: things like revisions that modified the file, the latest commit comment, etc. – The comment about how diffs look seems to indicate you haven’t investigate the alternatives out there: google code, review board, etc. Most do exactly what you suggest – hybrid between colour and lines on a side-by-side display. The line numbers show the precise lines for the file (either the previous or current). I agree that info about the file would be good. Maybe even display that in the main window until the user double clicks or clicks open? From a Git perspective, this looks good. I think from a UI point of view placing files in the tree view might lead to it being quite cluttered. I know that MS Explorer’s tree view and Google Code’s view only show directories in their trees, and show the files within a selected directory within the main view. This is my own personal preference, but I would prefer rev numbers to be shown with the file names or at least make it so that clicking on “More Details” is not the only way to view them. Thanks for all of your comments. They are really really helpful. And I think becuase I havent used a VCS browser that often, it’s a little harder for me to get a feel for what users might want so this is really good feedback for me. I’ll take all of them into consideration and hopefully have something new up by tonight! Thanks again!